Boots have come far from their inception in the early stages of civilization to their current, trendy look today. The evolution of the boot saw grunge style metal studs of the 90s to the hipster style hiking boots of today. You can even choose from cute denim versions or go for a vintage weathered style boot. With materials such as leather and suede, you can pick a boot for almost any season. 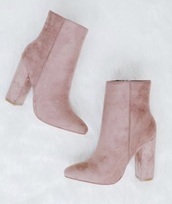 The height of a good pair of boots can also add instant style to your wardrobe. Go for over-the-knee styles for a dramatic look, or keep it classic with ankle boots.